Homeless people are being used as human internet access points in Austin, Texas, and earning money for providing this service. 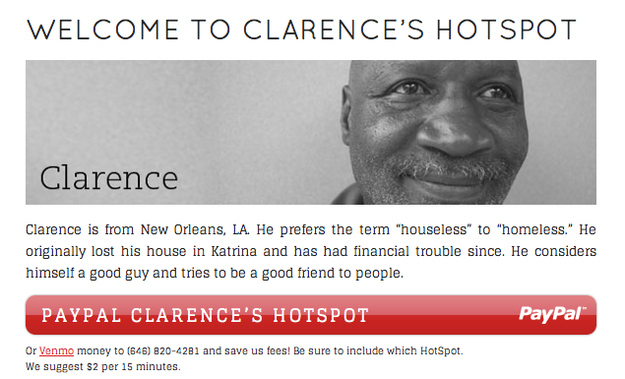 Homeless Hotspots is a charitable innovation initiative by ad agency BBH New York. BBH is also behind the recent Guardian/3 Little Pigs ad you may have seen. HH is a bid to modernize the 'street newspaper' (think: Big Issue) model we're all familiar with. Essentially, the agency has used South by Southwest, a prominent music, film and interactive festival, to 1) help raise money and awareness for the homeless population and Front Steps, an organisation based in Austin working to end homelessness and 2) promote themselves. The idea is that 4G hotspots are given to homeless people along with a t-shirt that says 'I am a 4G hotspot'. SXSW attendees have been encouraged to pay to access the internet (via MiFi devices carried by the homeless) either in cash or through PayPal/the Homeless Hotspots website, on which you can find out more about the homeless people involved, including where to find them if you require internet access. In each case, the money will go directly to the person who gave them access. We are not selling anything. There is no brand involved. There is no commercial benefit whatsoever. Each of the Hotspot Managers keeps all of the money they earn. The more they sell their own access, the more they as individuals make (it’s not a collected pot to be shared unless people choose to donate generally). The biggest criticism (which we agree with actually) is that Street Newspapers allow for content creation by the homeless (we encourage those to research this a bit more as it certainly does not work exactly as you would assume). This is definitely a part of the vision of the program but alas we could not afford to create a custom log-in page because it’s through a device we didn’t make. However, we’d really like to see iterations of the program in which this media channel of hotspots is owned by the homeless organizations and used as a platform for them to create content. Personally, I don't know whether this is a good or a bad thing. It's certainly using homeless people. We can all agree on that much. Whether or not they're being exploited depends upon whether or not you think BBH is benefiting more than Front Steps and the individuals themselves. I'm not so sure they are. Source: Wired and ReadWriteWeb, sent to me by James Macintosh, founder of Hope and Glory PR.